In order to be able to comment on and provide my thoughts on the L&OD world, I have to put into practise what I preach, otherwise I’m just a voice in the wind with little credibility. This is one of the reasons I enjoy blogging. It helps me to voice opinions on topics, and then gives me clarity of thought about how I intend to move forward. I’m fairly new to my current organisation, actually I’m a full 3 months in – go me! In this role, I’ve been trying to get to grips with all things OD and how they are manifest. Up until I started, pretty much all OD type initiatives have been about L&D solutions provided by external providers. We haven’t sought to use internal knowledge or experience in delivering the range of L&D solutions we need. We’ve also typically brought in external practitioners to help with OD projects around things such as team development workshops, coaching, and management development. One of the things I needed to do, was to get my head around the range of what those activities look like, and so I decided to hold an OD summit. To this summit I invited our internal people who helped co-ordinate or deliver OD in some way, and our external partners. We got together for a few hours, and talked about everything from the strategy of the organisation, some of the upcoming high profile projects, and sought input on things like the strengths of the organisation and where we can do more. Further to that, it gave me some ideas around ensuring that I find ways to keep our partners up to date with OD within the organisation so they’re getting the information first hand. I also felt that our partners had a better shared understanding of what we are jointly working towards, and what part they all play in the scheme of things. I’m also going to put a call out to ask for a set of internal facilitators to be trained in delivering a range of personal development courses. Currently we do this for some of the technical or specialist subjects we have and it works pretty well. What I’ve found, though, is we could expand this capability internally and encourage involvement from more parts of the organisation in the design and delivery of OD. After all, OD isn’t just my responsibility, it’s anyone who takes an interest in helping to shape the future of the organisation. I confess, this idea is not an original one – I’m stealing it shamelessly from a conversation I had with Andy Lancaster and Mike Collins at the last L&D Connect unconference. Well done them! Some of this may seem like run of the mill stuff, and I guess that’s partly the point. OD doesn’t have to be about the big flashy project, it can also be about the easy solutions which help make a difference. This week I put up a post about Organisational Development and my learnings from the L&D2020 workshop held by the Training Journal. Today I’d like to let you know about the actual session itself and the topics talked about. Linda Holbeche opened the day’s proceedings with an introduction to OD from her research based consultancy the Holbeche Partnership. She spoke about the ability of an organisation to be agile and ensuring the ‘right’ people are focused on the ‘right’ things and engaged in collective effort. To support you also then need the ‘right’ kinds of management and leadership, the ‘right’ business model, processes, structures and systems. I found Linda’s presentation a good introduction to OD and to provide a lot of context to the range of work that OD includes. Next we had Martin Saville present a fascinating OD model. Martin is an independent consultant and has his own practice – Martin Saville Consulting. The first point Martin raised is that those work in OD don’t come from a particular background, instead they have a mindset. That mindset is about looking at a complete organisation and finding ways to ensure each part understands that if a piece of work is to be achieved successfully, other relevant parts need to be involved, and if they’re not it has a direct impact on operational effectiveness. The model he presented is called the Burke-Litwin model which hopefully is presented below clearly. Okay so apologies for the lack of clarity – my first time trying to add an image to a post (any advice welcome). Essentially you have two broad categories of the way an organisation responds and reacts to change. There are transformational factors which are factors that drive the change. These include – the external environment, mission and strategy, leadership, the organisation culture and individual and organisational performance. Then there are transactional factors which you need in order for the the change to be effective. These include – structure, management practices, work unit, motivation, systems and processes, task requirements and individual and individual needs and values. Once you take some time to think about an OD challenge you are facing, you can look at the Burke-Litwin model to help you identify what are the factors you’ve considered and which you do need to pay attention to. Martin admitted the model isn’t perfect and excludes some factors such as communication processes but it at least provides a holistic perspective of the factors which will help support and drive change. This presentation was delivered by Lee Sears whom I have spoken about before in the post about the future skillset of L&D. The information he presented was no different to that, and if you’re interested, have a read of the post. What it did help to do was re-surface his findings of how L&D and OD are becoming more and more entwined. Even though they are separate disciplines, the cross-over is becoming more commonplace, and in fact many HR/L&D/Project Management/Internal Communication specialists are all engaged in activities which are in effect OD, but they’ve just not been exposed to the terminology or processes or structures to help them think of it in that way. There were some interesting case studies from the civil service and from a housing organisation that offered insights into how OD has helped with real organisational issues. Unfortunately, the decks weren’t available and so I can’t divulge information as it’s history now. From memory though, the housing organisation were reaching a point in their development where a number of mergers and formation of Group status meant OD played an important part in the way very different groups and senior management who had not worked together previously and were now expected to. The civil service was an interesting case of a department whose resources had been outsourced with the remaining incumbents feeling bereft of responsibility and control over what the outsourcing company was producing and the quality of that work was in question. OD helped to bring this group to accept what their situation is, what they currently do, their responsibilities, and then included the outsourced company in conversations about current and future practices. Where I’ve not included specific references to materials, all the above is taken from the respective individuals decks and is to be attributed to them directly unless otherwise stated. 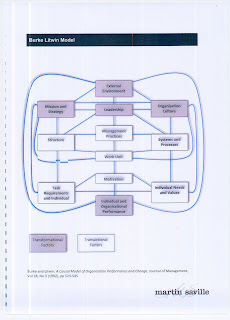 >So what is Organisational Development then? >On Monday I attended the last in the series of the Training Journal workshops entitled L&D2020 the future of workplace learning. This session in particular was about the Closing gap with L&D and OD – Organisational Development. The others that I’ve attended this year have been about understanding how to get ROI from training and the future skillset of L&D. This session was of particular interest to me because I find the world of OD fascinating. Organization development (OD) is a planned, organization-wide effort to increase an organization’s effectiveness and viability. Warren Bennis has referred to OD as a response to change, a complex educational strategy intended to change the beliefs, attitudes, values, and structure of organization so that they can better adapt to new technologies, marketing and challenges, and the dizzying rate of change itself. OD is neither “anything done to better an organization” nor is it “the training function of the organization”; it is a particular kind of change process designed to bring about a particular kind of end result. That’s a very good definition but it is long-winded. L&D is about the upskilling of staff across technical and behavioural skills. OD has a broader remit than that and is about looking at wider business needs to ensure the business is geared up to deliver on the strategy and KPIs. This can look like a variety of activities and initiatives from Onboarding programmes to employee engagement surveys to talent management programmes to grad programmes to competency framework development. And that’s a shortlist of activities. Where does OD sit then? More and more it’s the case that OD is its own department and normally reports directly into the CEO. But who is classed as an OD professional? Now this is the interesting piece. Although conventional wisdom may suggest it sits best with HR or L&D, in actuality the people involved in this line of work can come from Operations, Exec, Project Management, Strategy or HR. It’s not about a specific person as such that is best suited to OD but more a mindset. What yesterday helped me to realise is that I’m good at L&D. I’ve spent the last 8 years of my career perfecting this art and I’m doing a bloody good job of it. If i want to start expanding my role – and that’s what this is about, I need to start developing my understanding of OD theories and methodologies. I have an introductory understanding of some of the methodologies and of the range of activities or initiatives that require an OD approach. I think I’m starting from a good place, and from here on in it’s only about continuing my own learning on this and helping my business with both L&D and OD initiatives. I’ll be posting another blog this week about the actual session itself and the key messages from the different speakers and case studies. Posted on November 9, 2010 Categories UncategorizedTags learning and development, organisation development1 Comment on >So what is Organisational Development then?